The Heckel discus has only three dark transverse bands. 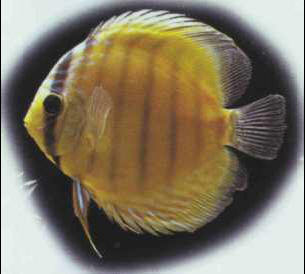 Unlike its cousins - the subspecies and varieties of S. aequifasciatus, which are mainly raised in captivity - the Heckel discus is usually procured from the wild. Tens of thousands of fish of these species are exported every year; there is little data concerning the nfluence of these culls on the natural population, but these Cichlids do not appear to be endangered. As a matter of nterest, the Heckel forms a modest food resource, on a very localized basis, for certain native populations. Size: 10-15 cm.